Thomas Sackville, 1st Earl of Dorset (1536-1608), Poet and Lord Treasurer. Sitter associated with 7 portraits. 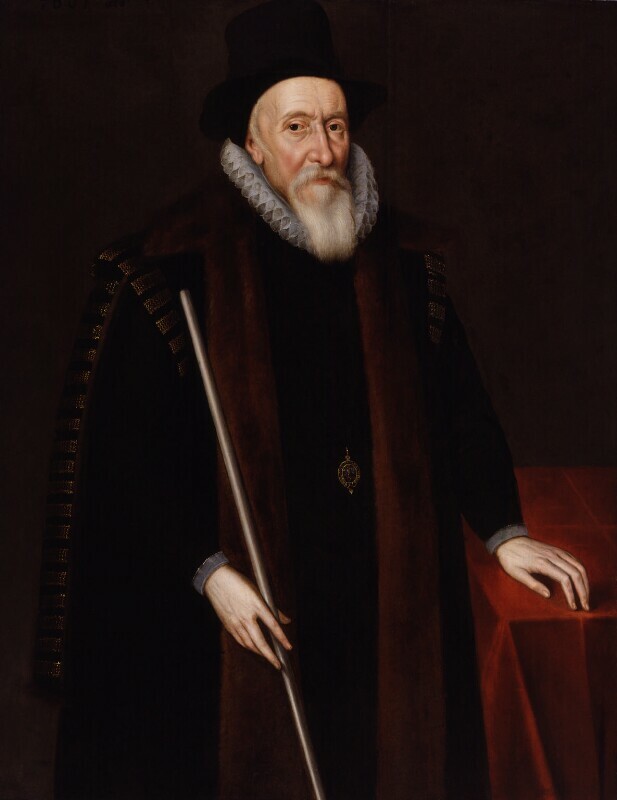 The white rod of office Sackville holds in this portrait probably refers to his appointment as Lord High Steward. A similar face pattern to that used to produce this portrait was used in the depiction of the sitter in The Somerset House Conference. This painting may have been produced within the workshop of John de Critz the Elder. Robert Devereux, Earl of Essex marches on the City but the rebellion fails. He is proclaimed a traitor and executed. A Spanish fleet lands in Ireland to assist the Catholic rebellion. Lord Mountjoy leads the English army to victory over the Irish and Spanish force at the Battle of Kinsale. Robert Cecil, Earl of Salisbury begins secret negotiations with James VI of Scotland to secure a peaceful handover of power after the Queen's death. William Shakespeare writes Twelfth Night. The poet and clergyman John Donne begins The Progress of the Soul, an unfinished satire on the soul of the apple eaten by Eve. The Speaker of the House of Commons Sir Edward Phelips builds Montacute House, Somerset. Sir James Lancaster leads the first trading venture of the East India Company to acquire spices from Sumatra. Spanish Hapsburg forces lay siege of the United Provinces port of Ostend. The town surrenders in 1604 after one of the longest sieges in history and bloodiest battles of the Eighty Years' War, during which the Protestant United Provinces of the northern Netherlands fought for independence from Spain. Tokugawa Ieyasu, ruler of Japan, makes his capital at Yedo (present-day Tokyo).